Lahore-December 28, 2018: The National Junior Selection Committee headed by Basit Ali has selected 15-member One-Day and T-20 squad of Pakistan U-16 team for series against Australia U-16 in the UAE. Umer Eman will lead the side in both One-Day and T-20 series. Pakistan U-16 will feature in a five-match One-Day series and One T-20 match against Australia U-16 from January 9, 2019. All the six matches of the series will be played at ICC Cricket Academy, Dubai, where both teams will arrive on January 6, 2019. The five-match One-Day series will be played on January 9, 11, 13, 16 and 18, 2019, whereas the only T-20 match will be played on January 20, 2019. Last edited by ataullah; 1st January 2019 at 18:32. Last edited by Abdullah719; 1st January 2019 at 18:36. Pretty ridiculous to arrange international fixture at this level. In England, there is a Bunbury Festival held every year that has the best 60 players in england at the u15 level playing in it. Around 90 players from that Festival went onto play for england one of them is Joe Root, ben stokes, Ian Bell, Cook etc. The top 16 from that festival play Sri Lanka u15 every year in Sri Lanka. Last edited by a_tahir; 1st January 2019 at 18:38. At least 75% of the players will be at least 3 years overage, and only one or two will be the correct age. Ahmed Khan and Ayaz Shah are promising fast bowlers, specially Ahmed. Hopefully they are selected on merit. Cant say if they are not because we do not know them. But yea I do expect better as Mudasser Nazar has revamped the youth levels in Pakistan. Watch the video they look of genuine age. If they are that is good news. From my area both Najaf Shah and Mohammad Amir were both liberally overage. Any particulars names we can look out in future? Faisal Akram is in the squad. Not really sure. Can only go by the scorecards here and they don't tell much. Main thing that is bugging me is that there's barely any big scores by the batsmen and mostly spinners at the top of the charts amongst the bowlers. Ahmed Khan and Ayaz Shah, both are fast bowlers. Then one can only hope this lot performs well against the Aussies. Future of batting in Pakistan is looking very bleak. While our neighbour is looking to outperform the invincible Aussies, our team is going to look worse than our national team of 2009-2015. It is worrying. You can’t fill a team with only spinners and fast bowlers. The Pakistan U16 cricket team will depart for Dubai from Lahore tonight to take on Australia U16 in a series of five 50-over-a-side matches and one Twenty20 fixture at the ICC Academy. The series will start with the first 50-over match on Wednesday, 9 January, and culminate with the T20 game on Sunday, 20 January. This is Australia’s return visit after Pakistan had toured Melbourne in April 2018. Australia had clinched the five-match series 3-2, while Pakistan had won the one-off T20 game by seven wickets. The Pakistan side will be led by Umer Eman, the Lahore-born left-handed batsman and leg-spinner, who, along with Aaliyan Mehmood, Rizwan Mehmood, Samir Saqib, had also toured Australia last year. Umer, after managing just 40 runs in four innings in Australia, had bounced back strongly by scoring 160 runs with a century and a half-century in the PCB U16 Pentangular Tournament 2018-19. In the PCB-Pepsi Stars U16 Tournament 2018-19, he scored 208 runs in seven innings at an average of 41.60 for Lahore U16 to finish the domestic season on a high. Umer was thrilled at the opportunity of captaining the team when he termed it as a ‘dream coming true’, and also set his sights on winning all matches against Australia U16 at the ICC Cricket Academy. This series is part of the PCB’s planning and strategy to provide maximum opportunities and exposure to the budding teenage cricketers in the build up to the next ICC U19 Cricket World Cup, which will be held in South Africa in 2020. “This is a big platform for the entire squad. By performing here, we can stake a claim for selection in the U19 team that will play in the ICC U19 World Cup in South Africa in 2020. We need to express ourselves and make our presence felt in the series,” Umer said. Reflecting on his visit to Australia last year, Umer said: “When I played in Australia last year, I made a few mistakes but since then, I have been working extremely hard to overcome these. I am sure this series will also help me in improving my game. Apart from playing some solid and hard cricket in Dubai, Umer is aiming to making some friends. “In Dubai, we will come across some of the players who were part of the last series Down Under. This presents us with an opportunity of knowing the Australian players better and making some friends. Meanwhile, Umer’s squad includes Fata’s fast bowler Farhad Khan, who at 13 years and 293 days, is the youngest member of the side. The squad includes a good balance of batsmen, all-rounders and bowlers who are all eager to give a good account of their talent against Australia. Batsmen like Mohammad Shehzad, Haseebullah, Rizwan Mehmood and Samir Saqib form the batting core. Shehzad had a good time representing Khyber Pakhtunkhwa in the PCB U16 Pentangular Tournament 2018-19. The right-hander scored 309 runs in his five tournament innings, including one century and two half-centuries. Shehzad averaged 103 runs per innings in the event. Left-handed Haseebullah, who represented Balochistan in the same event, scored 215 runs at 71.67 with one century and one half-century. Rizwan and Samir topped the batting charts in the PCB-Pepsi Stars U16 One-Day Tournament 2018-19. In his seven tournament innings, Rizwan, representing Hyderabad, amassed 355 runs with the help of three half-centuries. His top score was 92 while he averaged 88.75. Right-handed Samir scored 259 runs at an average of 51.80 in his seven tournament innings for Faisalabad with two half-centuries with a best of 74. The squad also includes some promising spin bowlers who are relishing the prospect of bowling on the ICC Academy pitches that often help the slow bowlers. The trio of Faisal Akram, Aaliyan Mehmood and Kashif Ali have all bowled well in the domestic season. Faisal, the left-arm spinner, led the bowling charts in the PCB U16 Pentangular Tournament 2018-19 when he bagged 10 wickets at 15.70 per wicket for Khyber Pakhtunkhwa. His tally included one five-wicket haul, while he maintained a steady economy rate of 4.24 per over. All-rounder Kashif, who also bowls leg-spin, was part of the Sindh team in the same tournament in which he took nine wickets at 14.89, including one five-wicket haul. The teenager maintained an economy rate of 3.44 per over. Karachi’s off-spinner Aaliyan was impressive in the PCB-Pepsi Stars U16 One-Day Tournament 2018-19 in which he collected 13 wickets at 11.69 per wicket in seven tournament matches. Fast bowler Ayaz Shah, who represented Fata in the same tournament, finished with 11 wickets in seven matches at 15.27 per wicket. Group photo of the Pakistan U16 cricket team with player support staff. Last edited by Abdullah719; 6th January 2019 at 12:02. Pakistan U16 begin their five-match 50 overs-a-side series against Australia U16 at the ICC Academy in Dubai on Wednesday with the game starting at 10h30 PST (09h30 Dubai time). The two sides are eagerly looking forward to the series, which is designed to give the future stars a taste of international cricket. Pakistan, led by promising all-rounder Umer Eman, have a right mix of batsmen, fast bowlers and spinners, who will be eying to establish their credentials at the junior level, especially with the prospect of representing their country in the ICC U19 Cricket World Cup to be played in South Africa in 2020. Pakistan cricket team manager Taimoor Azam Khan felt that more than winning the series, the opportunity of testing the skills of his teenagers would be the best take away from the tour. “It is a major step forward for the players vying to secure their spots in the national junior team for the ICC U19 Cricket World Cup 2020. We want to groom these players for the challenges ahead. It is a fantastic opportunity for the players to continue their development and play against their peers,” Taimoor said. Australia are being coached by former Test batsman Chris Rogers, who had toured with the senior Australia team for the two-Test match series in 2014 - the series that was won by a decisive 2-0 margin by the Misbah-ul-Haq led Pakistan. Four-and-a-half years later, Rogers, donning the U16 coach hat, was excited about the opportunity of testing his youngsters in different conditions to the ones they are used to back home. “The series is an opportunity for these young men to go and learn in different conditions and be challenged in different ways,” Rogers said. “It’s as much about the cricket as it is the life experience - learning about the game, and learning about life and other cultures. “We know the cricket is going to be challenging. Pakistan will have a really good side, and we’re excited about that challenge. Australia have named two ‘co-captains’ for the series with Jamison Murphy from South Australia sharing responsibilities with Queensland’s Noah McFadyen. The squad also includes some budding stars, keen on making a big impression in Dubai. Some of the Australia U16 players to watch out for include, Shobit Singh, a right-handed top order batsman from Victoria, who scored 311 runs at an average of 51.8 at the CA U17 Male National Championships in October. Tobias Snell, a wicketkeeper-batsman, who averaged 35 with the bat at the CA U17 Male National Championships and also took five catches and four stumpings; and Nivethan Radhakrishnan, an all-rounder, who can bowl with both arms - both left and right arm orthodox spin - and claimed seven wickets at the CA U17 Male National Championships. Ian Dixon and Shiju Sam will be the on-field umpires for all five 50-over matches and the one-off T2o match in the Pakistan U16 vs Australia U16 series. So developing 3/4 day players is not on PCB’s priority list. What a surprise. Thanks. I love reading seemingly innoculous trivia such as this. To play a t20 at this level is ridiculous. Why would you want to make 14/15 year old learn how to play across the line instead of teaching them to defend bat and pad close to each other. Is there any link of live score? Ahmed Khan 2/17 so far from his 5 overs. Last edited by Abdullah719; 9th January 2019 at 11:41. Let hope that we have a better batting talent according to Mudassar Nazar. Don't get ahead of yourself , wait for the pp age experts to give you a lecture how some of them are in their mid 20s. 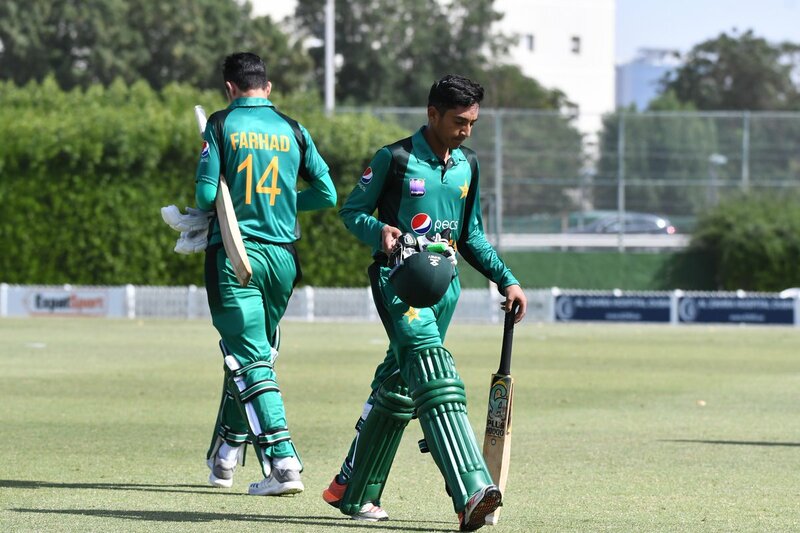 Pakistan U16 recorded a comfortable five-wicket win over Australia U16 in the first 50-over match of the five-match series at the ICC Cricket Academy in Dubai on Wednesday. Pakistan chased down the 171-run target for the loss of five wickets in the 40th over to go one-up in the series. The second match will be played on Friday at the same venue. Openers Haseebullah Khan (33, 6x4, 46b) and Ali Hassan (21, 4x4, 16b) got the team off to a flying start in their run-chase as they put on 36 runs. After Ali’s departure, Haseebullah consolidated the position with a 42-run alliance with Sameer Saqib (15). Captain Umer Eman contributed 20 off 30 balls with three fours, Kashif Ali scored 28 off 24 balls with four fours and a six, and Aseer Mughal chipped in with 22 not out with a four and two sixes from 43 balls. Aseer put on 33 runs for the unfinished sixth wicket with wicketkeeper Zubair Shinwari (13 not out) as Pakistan achieved the target with 62 balls to spare. Earlier, Australia, put into bat, were dismissed for 170 in 44.3 overs. The total was built around a 60-run partnership for the seventh wicket between Nivethan Radhakrishnan and Noah McFadyen after the Australia teenagers had slipped to 94 for six in the 28th over. Radhakrishnan, who was one of the two batsmen to fell to Umer, scored a well-made 44 off 62 balls. His innings included four fours and one six. McFadyen batted equally well for his 48 off 66 balls that included four fours and one six. The next best contribution came from skipper Jamison Murphy, who contributed a sedate 22 off 44 balls before he was cleaned up by Pakistan’s star bowler Ahmed Khan. Left-arm chinaman Faisal Akram also claimed three wickets,or conceding 33 runs in 9.3 overs. The spinner kept a tight leash on the scoring besides chipping away with crucial wickets towards the backend of the innings. Last edited by MenInG; 9th January 2019 at 18:59. Watched the highlights and the thing which excites me is that there was a left arm Chinaman playing and he looked good.Other than that it was interesting to see so many bowlers bowling action was identical to their idols.One of the Pak seamer had copied Dale Steyn's action and one spinner had exactly the same bowling action as of Zulfiqar Babar.Similarly an Aussie offie looked to bowl like Nathan Lyon. Ahmad has such a beautiful bowling action. Looks like we don't even find a single good batsman from this entire team. None of the player has the ability to score big. Why is it that Pak batsmen at all levels look to score through high risk aerial shots? 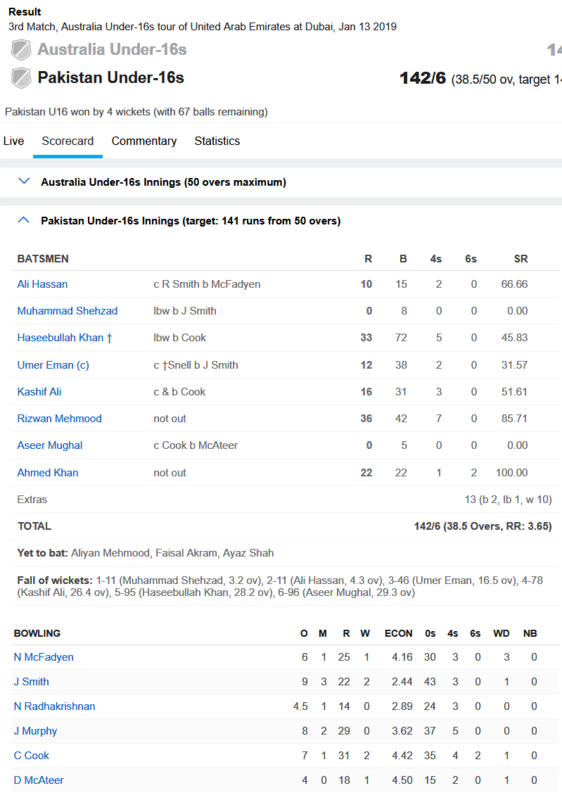 Having watched the highlights I am amazed to see that Pak batters looks much better than Aus counterparts both in terms of technique and strength specially the openers however Aus opening bowler seems to generating some serious pace much quicker than any Pak bowler played in this match. My gut feeling is that Pak will finish the series 4-1, batting looked much better. Last edited by MenInG; 11th January 2019 at 11:58. 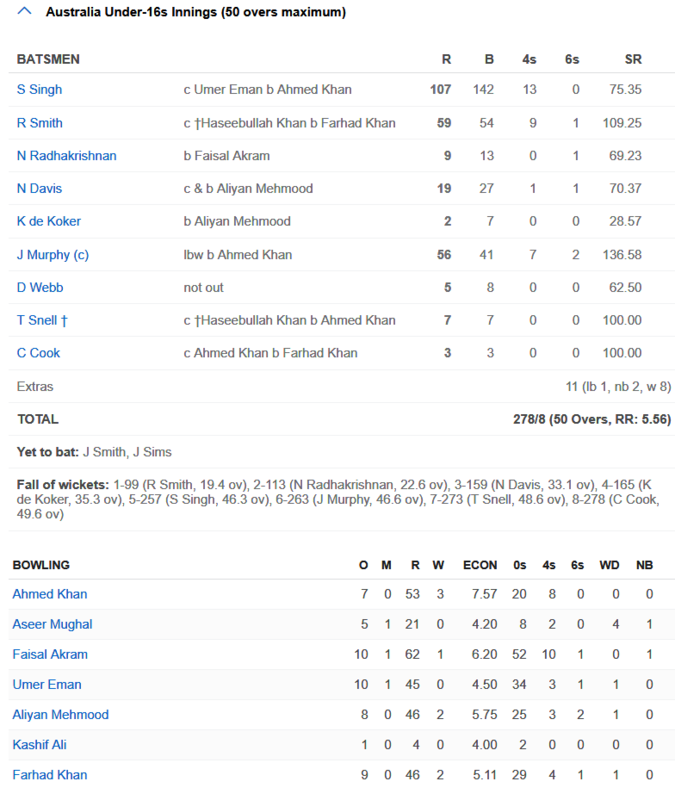 Did PAK set batting in reverse order today? That too after winning toss & batting first!!!! An all-round performance by Noah McFadyen and Nivethan Radhakrishnan helped Australia U16 to a three-wicket win over Pakistan U16 in the second 50-over match of the five-match series at the ICC Academy in Dubai on Friday. The result left the series tied at 1-1. Pakistan had won the first match on Wednesday by five wickets, with the third match to be played on Sunday. 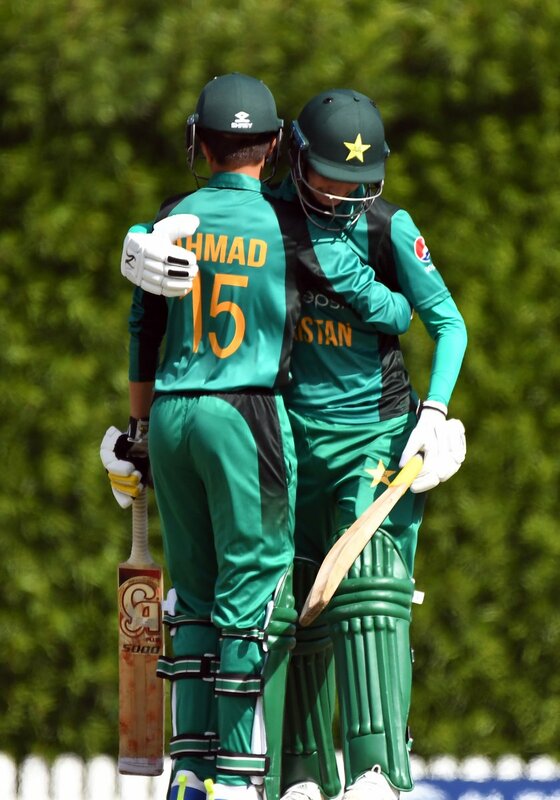 On Friday, the visitors chased down the target of 192 for the loss of seven wickets in 42.1 overs after their bowlers had done a commendable job to restrict Pakistan U16 to 191 for seven in their allotted 50 overs. McFadyen and Radhakrishnan shared a match-winning 100-run partnership for the fifth wicket after their team had slipped to 68 for four in the 20th over. McFadyen counterattacked with some style, hitting one six and nine fours in his 57-ball 59. Radhakrishnan batted equally well for his 59 that came off 85 balls and included nine fours. For Pakistan, Ahmed Khan and captain Umer Eman took two wickets each. Pakistan, electing to bat first, were rescued by the seventh wicket pair of Aseer Mughal and Ahmed Khan after their side was reduced to 94 for six in the 31st over. The two added 82 for the seventh wicket to help Pakistan finish at a respectable 191 for seven. 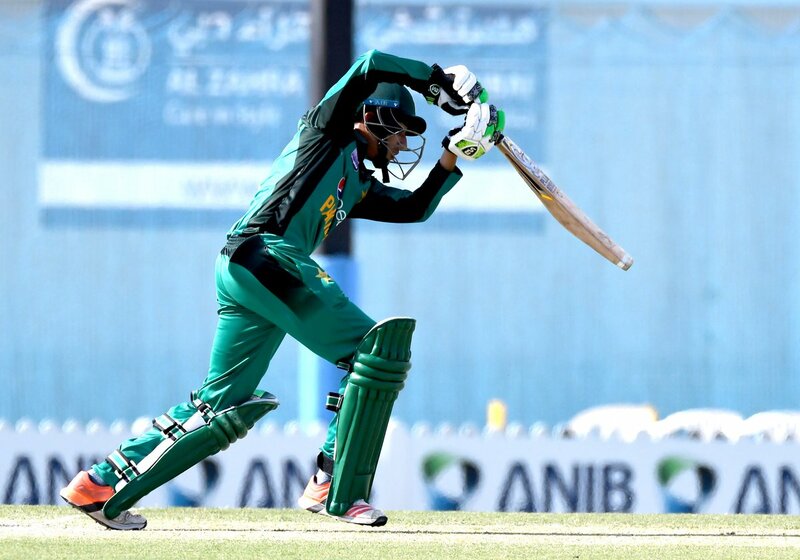 Ahmed, who was the star performer in the opening match with a three-wicket haul, proved his worth with the bat on Friday when he hit a stroke-filled 55 not out off 52 balls that included three sixes and three fours. Aseer batted with caution, using 93 balls for his 44 that included two fours. Kashif Ali was the other notable scorer, hitting six fours in his 31, while Umer Eman (17) and Sameer Saqib (19) added 39 runs for the third wicket. For Australia, fast bowler McFadyen was the pick of the bowlers when he dismissed both the openers and added Aseer’s scalp to end with figures of three for 42. Radhakrishnan took two wickets in 10 economical overs in which he gave away 24 runs. Keegan de Koker was the successful bowler, taking two wickets for 32 runs. Next match – third 50-over match, Sunday, 13 January. Shudder...grooming kids on UAE pitches. Gold for the Aussie kids to have a taste of these pitches. Last edited by MenInG; 13th January 2019 at 10:19. Aussies 140 all out in 3rd match. Ahmed Khan 3 wickets and Faisal Akram 5 wickets. 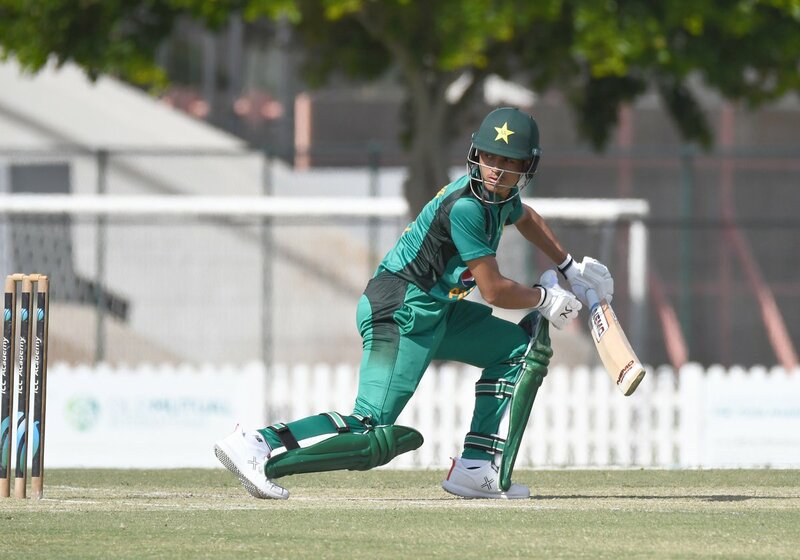 Left-arm chinaman bowler Faisal Akram bagged five for 26 and fast bowler Ahmed Khan produced an all-round performance (three for 40 and 22 not out) as Pakistan U16 defeated Australia U16 by four wickets in the third 50-over-a-side match to take a 2-1 lead in the five-match series at the ICC Academy in Dubai on Sunday. Multan-born Faisal and Swabi-born Ahmed had also starred in Pakistan’s five-wicket in the opening match last Wednesday by sharing six wickets between them. Faisal and Ahmed justified their captain Umer Eman’s decision to bat first when they bowled with discipline and accuracy, and took wickets at regular intervals as Australia were bowled out for 140 in 37.3 overs. Captain Noah McFadyen top-scored with a 65-ball 38, an innings that included five fours and one six, while Nivethan Radhakrishnan scored 33 off 40 balls with the help of three fours and one six. The two added 67 runs for the fifth wicket. In their target chase, Pakistan were off to a shaky start when they lost two wickets for 11 runs. However, Haseebullah Khan stonewalled at one end with a 72-ball 33 that included five fours. Pakistan were then reduced to 96 for six in 29.3 overs before a 46-run seventh wicket unbroken stand between Rizwan Mehmood and Ahmed Khan took them home in the 39th over. Rizwan remained not out on 36 off 42 balls, with his innings including seven fours. Ahmed, who had scored an unbeaten half-century in the second game, completed a satisfying day by following up his three wickets with a run-a-ball 22 not out. The fourth match will be played on Wednesday. Next match – third 50-over match, Wednesday, 16 January. Don't think our team will win this one. Batting is extremely limited and we will not score over 200 for sure. Great batting by our future batsmen (AKA Kohli, Tendulqar, Kallis...). 31/3 in 5.3 overs. Our future is really great. Rizwan Mehmood 4 of 24. Great batting!!!! They are kids brother. Let them play. Australia U16 won the fourth 50-over-a-side match of the five-match series against Pakistan U16 by a 27-run margin at the ICC Academy in Dubai on Wednesday. The series is now tied at 2-2 with the decider to be played at the same venue on Friday. 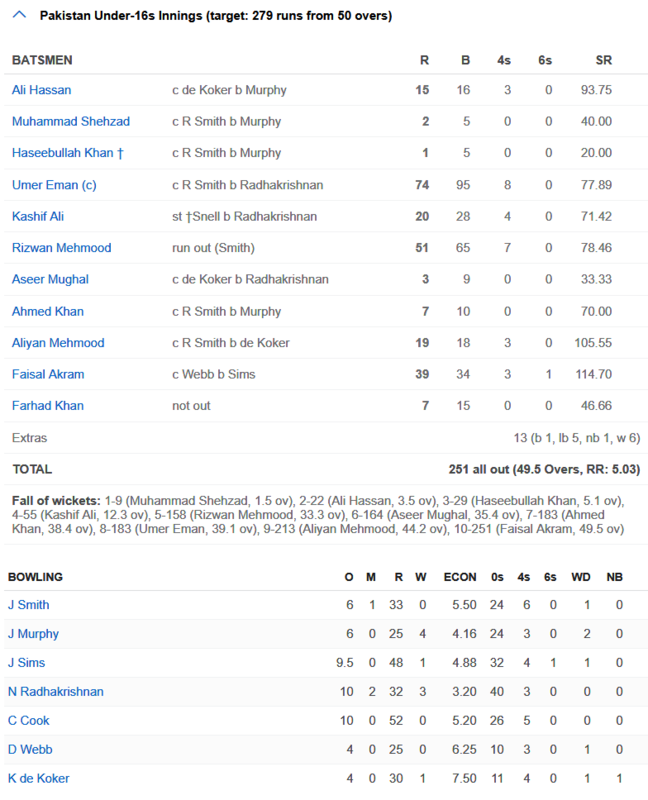 Chasing 279 runs, Pakistan were bowled out for 251 in the final over of the innings. Captain Umer Eman fought hard with a 74-run innings that included eight fours. The left-handed Umer added 103 runs for the fifth wicket with Rizwan Mehmood, who contributed 51 off 65 balls with the help of seven fours. The two had come together after Pakistan had been reduced to 55 for four in the 13th over. 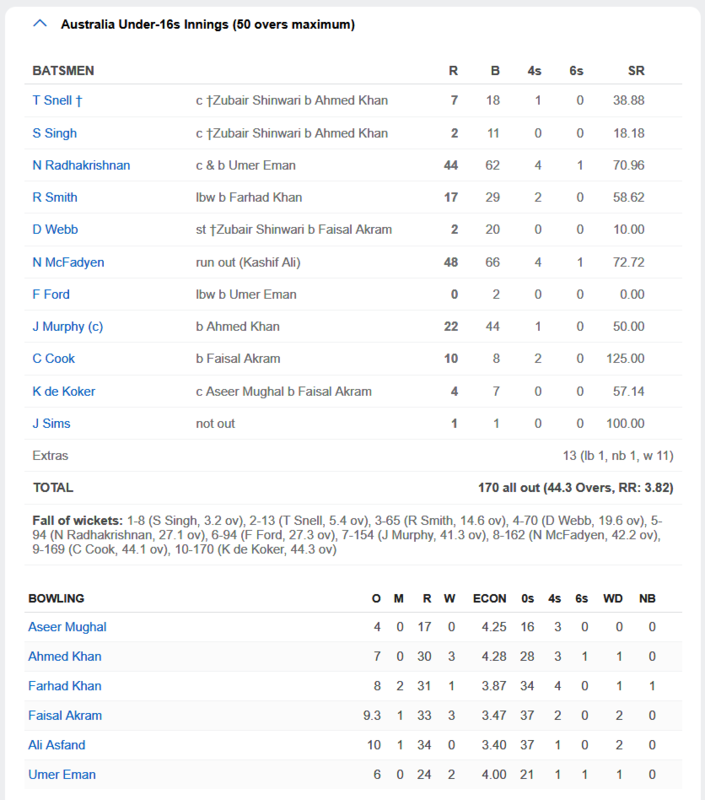 Tail-ender Faisal Akram also batted tenaciously at the backend of Pakistan’s chase scoring 39 off as many deliveries. Jamison Murphy, who captained the side today, enjoyed a great day with the bat and the ball. He was the star performer with four wickets for 25 runs in six overs after contributing 56 (41b, 7x4, 2x6) in Australia’s batting effort. Nivethan Radhakrishnan took three wickets in his quota of 10 overs. Earlier, opener Shobit Singh’s century helped Australia (put into bat by Pakistan) reach a formidable total of 278 for eight in the allotted 50 overs. Shobit was dismissed in the 47th over of the innings after scoring 107 runs off 142 balls. His innings included 13 fours. Shobit added 99 runs for the opening wicket with Ryley Smith (59 off 54 balls, nine fours and one six). For Pakistan, fast bowler Ahmed Khan was once again the pick of the bowlers. The right-armer took three-wickets in his seven overs. Ahmed has now collected 11 wickets in four matches, besides hitting a half-century. Fast bowler Farhad Khan and off-spinner Aaliyan Mehmood claimed two wickets each. Next match – fifth 50-over match, Friday, 18 January. Last edited by MenInG; 18th January 2019 at 10:18. Why Inzi keep selecting timid and defensive player like Sameer Sakib? This players have no future in modern day cricket.